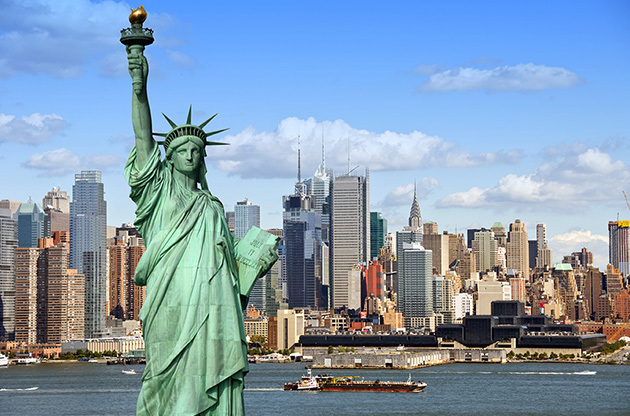 The packed guide for USA, featuring the information on its attractions, cuisine, big cities, transportation, events and practical travel tips. The land of magic and wonder, United States of America has been beating as the heart of the world for a very long time. There are many reasons why this giant country is this influential around the world however, it’s being a great destination to dig into is probably among the top 5 of those. With a population of more than 310 million people living in the 50 states, USA is like a puzzle with thousands of pieces in people’s mind. A lot is written and talked about, and I am sure it will be your pleasure to get to know the actual soul of the country that differ from state to state. Because despite the myths on its being scary and full of chaos, United States of America has got a lot more to offer than just the Hollywood movies and celebrity gossips. This massive land is divided into 13 regions. All of these 13 differ from each other in terms of the cuisine, density of population, the way people live, accents, climate and of course the traditions. This is why a trip to United States of America is like having only one slice of a cake which has more than 13 flavors. Although the capital, Washington, D.C itself is a beautiful city, it has always been shadowed by cities such as New York, Los Angeles and Chicago. While these three are known to be the top cities to visit in the country, cities such as Miami, Boston, San Francisco, Phoenix, San Diego, Las Vegas and Seattle are also popular among the visitors. As being a major influence and source of inspiration, United States of America may be the only country that we know a lot about without realizing. We know their independence day, at least 3 of their presidents throughout the history, actors and actresses. We let this country to rule our daily life with its technological achievements. But still, going there and meeting the actual life there is one experience that you’ll always be glad to remember. The United States of America is on North America. The country also has got both populated and unpopulated areas in the Pacific and Caribbean. USA has got strong regulations regarding the visa procedure. Accurate information can be found on Official Visa Information Source of the United States. Although USA is a huge country, traveling around the country is not a problem. Thanks to the airports in all the states, located in the major cities, it is easy to reach the destination within the country. In addition, low cost regional airlines offers advantageous tickets if bought in advance. If you wish to see around while traveling, then renting a car is the best choice to go for. It is not only economical, but also a highly preferred way by the travelers. Car rental offices are abundant in big cities as well as airports. Keep in mind, you need an International Driving Permit to drive in the U.S.
You also have options as train and bus. However keep in mind, train in the U.S is not among the popular way of transportation and may be surprisingly expensive. If you are still determined, you can check Amtrak, the official train service provider in the country. Greyhound on the other hand, is the widely known bus company. United States is everyone’s lover when it comes to shopping. Not only because it is literally limitless, but also for being much more affordable in comparison with the other countries. However it is always good to know some points before you set out for spending the dollars in this beautiful country. What do I mean by this? I mean this: a box of milk, the same brand, the same amount will not cost the same in New York and in Los Angeles. The prices listed almost never includes the tax, keep in mind. You can even pay a 2 dollars bill with your card in United States. If a restaurant or a bar doesn’t accept cards, it almost always have a warning saying so outside. I am sure you already know what to buy from the States even now. When you arrive you’ll notice the outlets are popular in this country. In addition you are going to come across to malls, flea markets and auctions no matter which part of the country you are in. Don’t forget to stop by some popular American chains such as Macy’s, Walmart, Target, Barnes & Noble and Best Buy. Without doubt, U.S is a generous country when it comes to the attractions. Regions being different from each other greatly bring a rich variety of things to do. It doesn’t really matter which part of the country you’ll be visiting. I am sure there’ll be something around that will be a true excitement to experience. Here is a list of 10 most breath taking attractions in the United States. But don’t forget, there is a lot more than these in the country. You’ll never suffer from hunger in the US. Food is basically the easiest to find no matter what you want to have. Instead, it might be useful to tell about the types of restaurants you’ll come across in the States. Fast Food restaurants are everywhere. For example, there are more than 14.000 McDonald’s around the country. You’ll also notice the local fast food chains in the area you go. Fast-Casual Restaurants are sort of new. They are known to be rather healthier than the fast food chains and they have more options in the menu. Chain sit down restaurants are typical American experience when it comes to food. You should try at least one of them. My personal suggestion would be Applebee’s. Then comes the Diners you are used to see in almost all of the Hollywood movies. They offer a wide range of choice that come in large portions. If what you want is not here, you can find a decent restaurant that wouldn’t hurt your wallet much in the city you are in. That would be accurate to refer USA as the apple of the world’s eye. This massive country, as being a center for all sorts of tourism, becomes one of the most predominant centers for international congresses, conferences, symposiums, tradeshows, exhibitions and fairs as well. The major cities such as New York, Los Angeles, Chicago, Boston, Washington DC and San Francisco are visited by a large number of event tourists every year. The one of a kind venues and cities that has a unique feeling in USA change the notion of participating in an event for most of the people.